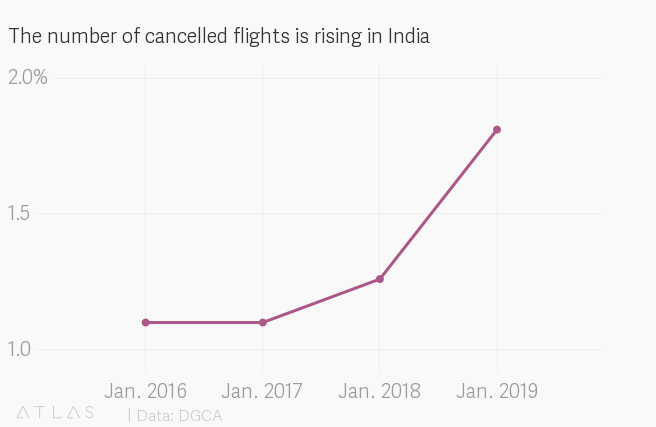 Flight delays, cancellations, and other passenger complaints have been the inescapable flipside of India’s soaring air passenger traffic. But a regulatory policy that is too sympathetic to passenger grievances always carries the risks of hurting the bottom lines of India’s embattled aviation industry. Hence the ministry of civil aviation’s Feb. 27 “passenger charter” appears to be a balancing act between the two. In drafting the charter, the government has been careful to heed some of the concerns of airlines. Take the case of ticket cancellations. The draft rules released last May had proposed that passengers should get a full refund if they cancel a ticket. But the final rules say the passenger is not eligible for this if the cancellation happens within a week of the flight’s departure. This assumes added importance given the spate of flight cancellations in India recently. “Be it (due to) engine trouble, pilot shortages with GoAir and IndiGo, or (problems at) Jet Airways, a lot of cancellations have been happening across airlines,” says Ashish Nainan, an aviation analyst with the ratings agency CARE. Data from India’s civil aviation regulator, the directorate general of civil aviation (DGCA), confirms this trend. While the charter has given airlines some leeway with cancellation charges, it is more stringent on practices like overbooking. Expecting a few passengers to not show up, many airlines tend to overbook flights by 2-3% of their total capacity, explains Nainan. If the extra passengers cannot be accommodated on the booked flight, they are usually allotted another flight. The passenger charter guarantees compensation to travellers if the rescheduling delays their journey by over an hour. Overbooking is now likely to become less common, impacting airlines’ revenues, Nainan added. This may compound the woes of the industry, already battered by rising fuel prices, a depreciating rupee, and intense competition that has kept fares at rock bottom levels. But rules, of course, run the risk of being futile if they can’t be enforced. And that will be a key concern going forward, admits Mark Martin, founder and CEO of Martin Consulting. According to the charter, a passenger not satisfied with an airline’s response to her grievance can escalate the complaint on the government’s AirSewa app. This provision, Martin says, is insufficient. “We are one of the largest aviation markets in the world and yet we don’t have a court dedicated to aviation disputes,” he said. While the rules, in many cases, allow for compensation claims, they don’t go very far in providing stranded passengers with remedies, Martin added.